This is a nursing home wrongful death case filed on behalf of a man in Montgomery County. IT was filed in Health Claims Arbitration on January 10, 2017. This is the 13th medical malpractice case to be filed in 2017 in Maryland. It is the second pressure sore wrongful death malpractice case filed this year. Decedent is admitted to Shady Grove Center (a Genesis facility) to be rehabilitated for independent living. When he is admitted, he is suffering from acute exacerbation of a chronic illness, but he does not have any wounds or sores in his sacral region. Within one month of residing at Shady Grove Center, decedent develops a significant pressure ulcer on his sacrum. This pressure ulcer becomes infected, and is not properly treated. This contributes to his death less than two months after the ulcer developed. The standard of care for the prevention of and treatment of pressure ulcers is the same for nursing homes as it is for doctors. The resident must frequently be turned, preferably every two hours, the area at risk should be kept clean and dry. A Stage I formation of a pressure ulcer is not medical malpractice. Proper tracking of the pressure ulcer required documentation of the stage, size, color, odor, and drainage of the bed sore. The defense in bed sore cases is that there is a consensus in the medical community that not all pressure ulcers are preventable. It is true that pressure ulcers can occur despite early evaluation of risk for pressure ulcer development and interventions to prevent pressure ulcers. In this case, Genesis is likely to argue that this woman's bed sores were really caused by her underlying condition. But the reality is that the vast majority of pressure sure cases are preventable with due diligence. One thing Genesis could do to avoid all of these pressure sore lawsuits is to identify residents who are at high risk for developing this condition. Clinical conditions that are the primary risk factors for developing pressure sores include, resident immobility, urinary incontinence or chronic voiding dysfunction, chronic or end stage renal, liver, and heart disease and malnutrition/dehydration. 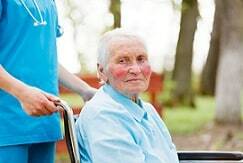 If you suffered due to the negligence of a nursing home or a doctor, Miller and Zois can help. You are entitled to justice and compensation. We have a long history of large verdicts and settlements in nursing home and wrongful death cases in Maryland. Get a free case consultation, or call one of our nursing home attorneys at 800-553-8082. Take a look at the settlement value of bedsore claims in Maryland. One big value driver is the stage of the bedsore and whether the victim survives.